Dying your hair is a way of life for many, but deciding to change your hair color can also be intimidating. Ready to try something new, but wondering how it might look on you? Try an app that can help you decide how to change your hair color. The app store is full of options to play with hair and makeup, but the majority of those apps are buggy and filled with advertisements, offering limited functionality. We've researched the three best hair color apps, top-rated and straight from the pros, to help you visualize your future look. Looking to try something really unique? Hair Color Dye - Switch Styles will let you decide exactly what you want. The color styles are varied and vibrant, with the option to select a color and apply it to the hair by hand as well. Want red, but only on the tips? No problem. Want a stripe of neon blue in your bangs? You can do that with this app. Full creative placement of color. You can paint each color individually, so the sky's the limit. You can select the hair area to edit, so your style doesn't have to be super basic to use the app. It can be difficult to accurately select the hair area. You're required to watch an advertisement to save your photo after you've achieved the look you want. Coming from hair guru Redkin, YouCam Makeup is a solid app to try on a new hair color. The app uses augmented reality, taking your live image and overlaying different hair colors on top. You'll want to have your hair styled down and use the app against a solid background wall for the clearest shot of the color overlay. Augmented reality means the app applies color automatically. 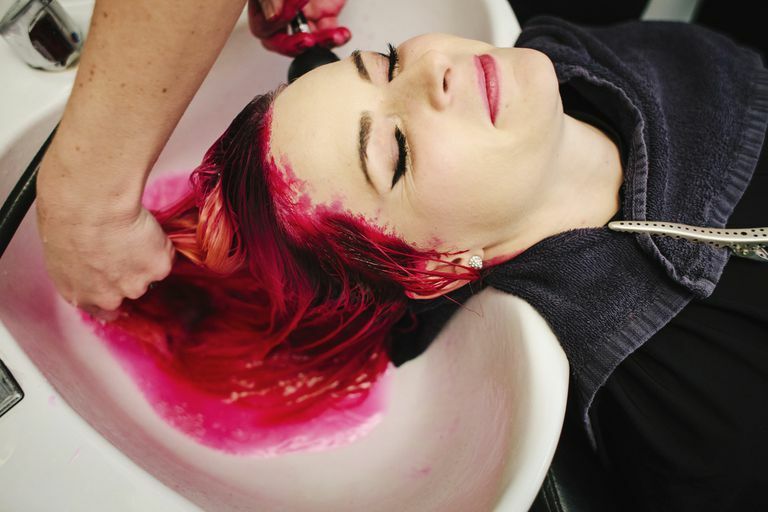 References actual hair dyes you can take to your stylist to use. Allows you to try makeup looks. Includes fun selfie filters for social media. Only applies a uniform all-over color to your hair. The free version has a watermark on some saved photos and includes some ads. Style My Hair from L'Oreal Professionnel Paris is the most flexible, accurate hair color change app we've found. Using augmented reality, Style My Hair takes the YouCam Makeup technology and adds in features that give you much more control over your style. TONS of color palates to choose from. The option of a before/after shot, showing half of your image with your current hair and half with your future color. Varied application of color; Sombre, Ombre, and Grow Out (closely resembling Baylayge) are all options, showing how the color would look just on your hair ends, soft partial highlights, with a natural grow out application. It's free and without ads. Sometimes there's a slight delay in the video, but if you keep the app updated it should run smoothly.